Flight special bookings can participate in our travel voucher system - email a write-up of your flight to cheapflights@southafrica.to and we'll send you a flight discount voucher. Ask for help - travel is what we live for & we are itching to help YOU! Want to book a cheap flight? Here's the latest flight specials in South Africa, in particular from Mango, FlySafair, South African Airways, Kulula and British Airways Comair, but also for international flights. The prices below do not constitute an offer, but merely the provision of information by a 3rd party. *Very important: the airfares below may have changed (the longer the time since publication, the greater the chance of it having changed). Unless otherwise specified, the prices are for 1-way flights. Subscribe to our mailing list to regularly receive email updates on flights. 11 April: Plan your winter break with affordable direct flights to Mauritius! 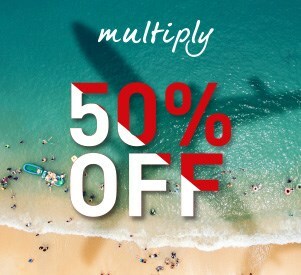 Book before 26 April 2019 and travel on selected dates until 31 July 2019 with Air Mauritius. 12 March: Escape the winter blues with Emirates flights to Phuket, Bali and Bangkok starting from only R7,234*. Book before 31 March and travel on selected dates between 21 April and 30 October 2019. 26 February: Save on flights to London when booking before the 1st of March 2019. Travel on selected dates until the 31st of January 2020 with SAA to save. 21 February: Book Emirates flights before the 28th of February 2019 to save on flights! Travel on selected dates until 30 November 2019 to destinations like London, New York and Paris. 14 February: Celebrate Valentine's Day with a romantic trip. Save on flights to the UK, USA and Europe with British Airways! Book before 19 February 2019 and travel on selected dates between 1 May 2018 and 31 January 2020. 12 February: Save up to 30% on flights to Australia and New Zealand with Qantas when booking before 17 February 2019. This is for travel on selected dates until 18 November 2019. 5 February: Save on flights to Mauritius when booking today! Book before midnight to save on Air Austral flights on selected dates until 30 June 2019. 31 January: Save 25%* on FlySafair flights today! Book before midnight, the 31st of January 2019, for travel this February to save. *Only applicable on the base fares and excludes taxes. T&Cs apply. 29 January 2019: Save on Emirates flights to the United States of America when booking before 6 February 2019. Travel on selected dates until 30 November 2019 to destinations like New York, Washington and Orlando. 25 January 2019: Save on flights to Australia with Qantas' Australia Day! Book the individual sale until midnight on the 26th of January 2019 and there are only 12 hours to book the companion sale! Get all the details here. 17 January 2019: Fly to Mauritius from only R6,339* with SAA. These flights departing from Johannesburg needs to be booked before the 31st of January 2019. Travel until 12 March 2019. 14 January 2019: Save on Emirates flights to destinations around the world! Book before 21 January 2019 to save on flights until 30 November 2019. 8 January 2019: Save up to 40% on international flights with Qatar Airways' Global Sale! Book before 16 January 2019 to save on flights departing from Cape Town, Johannesburg and Durban. This is for travel until 20 May 2019. 3 January 2019: Book SAA flights to Mauritius before the 10th of January 2019 from only R6,468*. Travel on selected dates between 10 January and 12 March 2019 to save. 4 December 2018. Save on Emirates flights when booking before the 6th of December 2018. Travel on selected dates between 7 January and 31 March 2019. 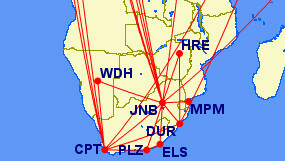 Flights depart from Cape Town, Durban and Johannesburg to destinations all over the world. 23 November 2018. Travel down under with Qantas from only R8,230* this Black Friday! Destinations include Sydney, Melbourne, Adelaide and Perth and flights depart from both Cape Town and Johannesburg. Book flights before midnight on the 26th of November 2018 for travel between 4 Feb - 14 April 2019 and 5 May - 10 Sep 2019. 23 November 2018. Book flights to Vietnam with Cathay Pacific from only R9,095*! Book before 26 November 2018. Travel from Johannesburg is for between 13 Jan - 31 May 2019 and travel from Cape Town is for between 22 Nov - 18 Feb 2019. 23 November 2018. Save on FlySafair flights! Flights between Johannesburg and Cape Town start from only R660*! Book before midnight to save for travel on selected dates. 23 November 2018. Save on Kulula and British Airways Comair flights this Black Friday! Book before midnight on the 23rd of November 2018 to save on flights for travel between 14 January and 28 February 2019 on Kulula. On the BA sale you can travel between 18 December 2018 until 31 January 2019. 22 November 2018. Save on flights to Brazil with TAAG Airlines. Book for travel between 14 January and 31 October 2019 to save on flights to Rio de Janeiro and Sao Paulo. 20 November 2018. Get a head start on Black Friday and book SAA flights to Maurtius from only R6,358* before the 26th of November 2018. This is for travel between 15 January and 9 March 2019. 6 November 2018. Save on selected flights to Thailand this November! Book before the 9th of September 2018 for travel until the 5th of December 2018. Flights start from R7,410* between Johannesburg and Bangkok and R7,430* between Johannesburg and Phuket. 1 November 2018. Save on European flights with Emirates this week! Book before the 7th of November 2018 to travel this November. Destinations include Moscow, Lisbon and Madrid among others. 18 October 2018. Save on Virgin Atlantic flights when booking flights before the 31st of October 2018. This is for travel on selected dates between 1 November - 10 December 2018 and 24 December 2018 - 31 March 2019. 16 October 2018. Save on European flights when booking with Etihad before the 25th of October 2018. Travel on selected dates between 22 October and 28 February 2019, excluding December 2018 flights. Destinations include Paris, Amsterdam, Manchester, Rome and more. 4 October 2018. Save on flights to Europe next year with Alitalia! Book before the 31st of October 2018 to travel on selected dates between 14 January and 11 April 2019. Flight prices start from only R6,761*. 2 October 2018. Planning a trip to Thailand? Emirates flights departing from Cape Town, Durban and Johannesburg start from only R7,114*. Book by the 14th of October and travel in November 2018. 27 September 2018. Save on flights to Mauritius when booking before the 31st of October 2018 for travel between 15 January and 9 March 2019. These SAA flights from Johannesburg and Durban start from only R6,580*! 20 September 2018. Save on flights to the USA when booking before the 27th of September 2018. Travel to New York, Seattle, Los Angeles and more before 31 March 2018, excluding December 2018, and save! Don't delay, book today. 19 September 2018. Save on Emirates flights to Dubai when booking before the 27th of September 2018. Travel before the 31st of March 2019, excluding December 2018. Not only are you saving on direct flights, you'll also get a third free checked bag! For a small additional fee you'll get a 30-day Dubai visa included! 4 September 2018. Save on Emirates flights to destinations around the world when booking before 10 September 2018. Travel before 9 December 2018 or between 24 December 2018 to 1 January 2019 and between 13 January to 31 March 2019 to save on flights from Cape Town, Durban and Johannesburg. 29 September 2017: Save up to 50% (depending on your membership status) on Mango Airlines when using your Momentum Multiply Rewards. 15 August 2017: Save up to 25% on Mango flights this August and September when you book flights on Mango's website and enter your Edgars account number. Club members get up to 25% off and non-club account holders get up to 20% off. This offer is subject to availability. Get details here. *All quoted flight prices is based on the lowest prices available at the time of publication. These prices are subject to availability, changes and any additional requirements stated.